In the wake of the great zombie craze of recent years, films featuring the undead monsters have become a dime a dozen. You won’t see hardly any of them on the big screen, but the independent scene is rife with them. And with so many similar zombie films out there, how can you know which ones are truly worth a watch? A great zombie-comedy is particularly difficult to achieve. They of course have to be genuinely funny, but they also have to bring a little something new to the subgenre to keep things interesting and fresh. Here we’ve spotlighted four of the best zom-coms from recent years that might have flown under the radar but definitely deserve a lot more attention. Probably the best and most inventive film of the bunch, A Little Bit Zombie from 2012 is a riot from start to finish that will entertain and surprise you at every turn. Reluctant groom Steve is bitten by mosquito carrying the zombie virus while relaxing at a cabin in the woods with his fiancé, sister, and best man before the wedding. He only becomes “a little bit zombie” though as he can still think like a human but is physically one of the undead. The film brings in some of the old with Steve’s insatiable appetite for brains, and introduces a lot of the new, especially with the characters of Max and Penny – a zombie hunter and a zombie scientist, respectively. Every single character brings their own kind of comedy to the film, and the physical comedy is just as impressive and hilarious. There is a definite lack of gore in A Little Bit Zombie, but you’ll hardly notice because of all the fun you’ll be having with the story. Stephen McHattie as Max with his Tactical Bacon, the way Steve drools every time someone says the word “brains,” and the unexpected but riotous ending will more than make you happy that you gave A Little Bit Zombie a little bit of your time. Somewhat similar to A Little Bit Zombie, Deadheads was released just one year earlier in 2011 and took an equally funny and different approach to the genre. After the zombie apocalypse, a young man named Mike awakens to find out that he is one of the living dead but still has his human side, though he has lost most of his memory. He meets up with another sentient zombie, Brent, and together the two set off on a road trip to reunite Mike with his girlfriend. Deadheads features a smart story wrapped up in a bit of a mystery, and the smart and witty dialogue performed with excellent comedic timing by the actors will no doubt keep you watching until the end. Colorful characters – including a pet zombie named “Cheese” and outrageous zombie exterminator McDinkle – keep Deadheads unique and lively throughout. The makeup work on the zombified Mike and Brent is just as impressive as the awesome and hilarious gore gags. A zombie film with the heart of a buddy comedy, Deadheads is sure to be one you won’t soon forget. The name may make it sound like it’s going to be another Shaun of the Dead, but Cockneys vs. Zombies offers up a different dose of zombie gore and rude humor. There is an outbreak of the undead on London’s East End and caught in the middle are a group of young kids who have just robbed a bank in order to save the retirement home in which their grandfather and his friends live. 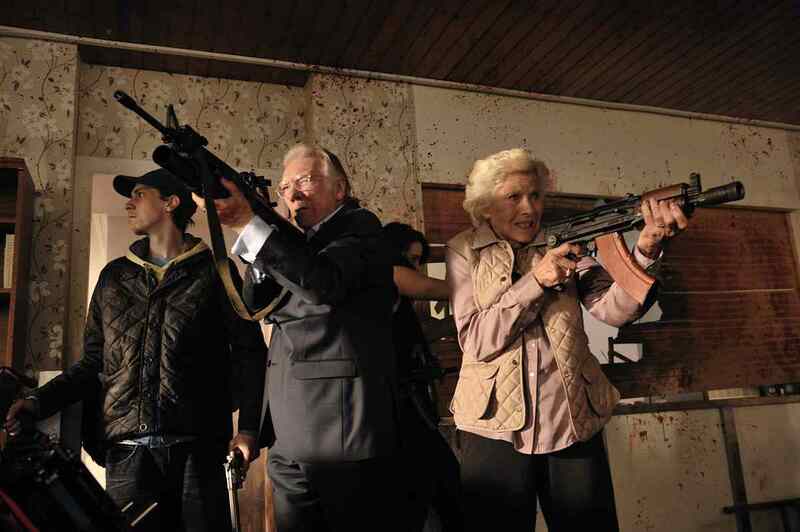 Major points are given to this movie for showing us old people who have serious potty mouths and who also have no hesitation about mixing it up with some zombies to save themselves and others. Cockneys vs. Zombies also boasts more than a few impressive and hilarious gore gags with lots of blood and guts and whatever else is inside the human body. There is also some wonderful situational comedy moments, including one great scene that mocks the slow-moving zombies by having an old man escape from them with a walker, and another involving a character with a steel plate in his head. Another film from across the pond, this 2013 UK feature has gone wildly unnoticed since its DVD premiere in the US in March 2014. However, it is probably the one I would recommend the most out of the four films mentioned here. Stalled is the tale of a lonely maintenance man named W.C. who gets trapped in the woman’s bathroom when the zombie apocalypse breaks out at an office Christmas party. Stalled gives itself a limited cast and location to work with but uses those limitations to its advantage. Though slow to get going, the moment this film switches to a zombie comedy is when things really get good, and the film gets incredibly inventive with its action and dialogue. The lead actor carries the film well and creates a great character for the audience to follow. The other main character of the film is only heard and not seen, and her dialogue delivery really pumps the film up and keeps the pace alive. The film does not get completely bogged down by the comedy, though, and really shows a lot of heart from the evolution of W.C.’s character. The gore is equally inventive and abundant, and adds to the comedy element. Stalled is a brilliant new take on the zombie genre that should more than please fans.